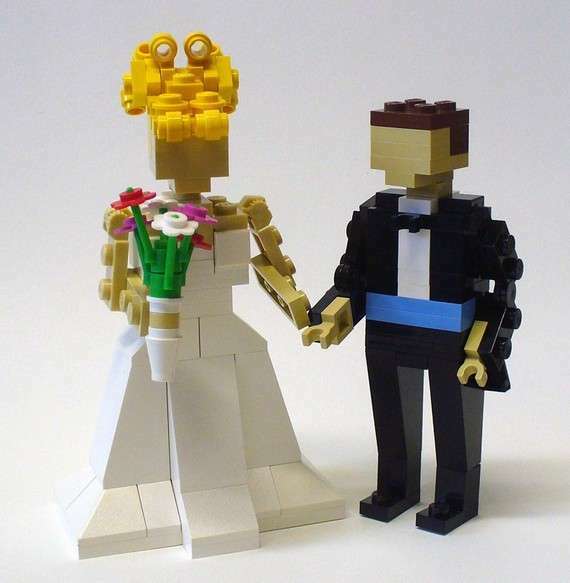 Calling all nerd-loving, adorable couples: allow me to bring to your attention the LEGO Wedding Cake Toppers. These cute figurines are made of LEGO building blocks and are made to sit on top of the tiered cake on your big day. If you want a unique and quirky way to add a personal touch to your wedding cake, the LEGO Wedding Cake Toppers are just the thing for you. For $100, you can pick one of the pairs shown above, or thanks to Etsy seller FoldedFancy, you can send in a picture of yourself and your loved one to request figurines that look like you. You also have the option of requesting a mini LEGO wedding cake, background arch, heart background, bridesmaids and wedding favors, all made of LEGO, of course.